How to Drive a Stand Up Forklift - Be Certified Today! Stand up forklift is very useful piece of machinery inside the warehouse. It offers very significant advantages compare to other types of forklifts. It can be operated in very closed quarters and narrow aisles. Many distribution companies, warehouses and docks, prefer this type of machine especially when they stock merchandise at tall racks and cases. Stand ups allow the driver to operate the truck while standing, this present a very good mean of getting things done. This type of machine can help workers do their job very easily. But it cause severe accidents and injury to the operator and people around. Hence, if you wanted to drive this forklift, we have prepared this tutorial for you to drive it safely and securely. Starting a forklift is just like starting your car. Turn the key to start the machine. Always check the forks are drawn back prior to starting. When moving without loads, the forks must be pointed up a little. Do not operate the machine with its forks raised up into the air. The control handle serves as the steering, when you want to go forward, tilt it forward, while pressing the pedal. Stepping on pedal will let the lift go forward as well. When reversing, look around, observe for obstruction and fellow employees form behind or at the sides. Pull the control handle down, to the reverse direction, then press the pedal. When picking up load from height in a rack, use the control handle to hoist the forks. Position the forklift in front or below the rack where the pallet you need is placed. Extend the fork by pressing the button near the control handle. Ensure that the forks can get inside the pallet of the load, by moving in closer. When the forks are firmly in placed inside the pallet, slowly raise the load slightly off the rack, retract the forks. Reverse the truck, make sure no one is behind and look for obstruction, clear the rack, then safely bring the load to the floor. When transporting the load to another place, make sure that the forks are elevated about 2 inches above the ground for clearance. When you want to place the load in a rack instead, you can perform this procedure in reverse. Get certified first. When you are new to operating stand ups, always take a specific training course. Ask your employer to provide you such training. Never operate unless you’ve completed the training course. The operational controls of the stand up forklifts are very sensitive and responsive, with just slightest movement, the truck can response very quickly. Always assure that forklift is ready and on stand by for the next action before the operator can step on the floor pedal. The pedal when pressed delivers power to the forklift controls. When driving, raise the forks up, never drive the forklift with its forks lowered. The forks must be in operator eye level, that way, can see the direction and maneuver the truck appropriately. When reversing, always maintain a good habit of watching for people around at the back, not just people, but also look for possible obstacles that you can collide with. Sound the horn when backing up. It will let other workers know that you are reversing preventing them from passing behind. When picking up load from height, stay in stationary position first, lower the forks slowly, never drive the truck when its load is still raised. This is a good recipe for tip over because the center of gravity is so high and can cause the truck to become unbalanced. Sound the horn when approaching intersection. This make other vehicles and people around that you are passing. Operators can get off and on easily. During the course of an 8-hour work shift period, forklift operators can get on and off the stand up forklift many times very conveniently compare to sit down truck because of its low step height of just eight inches. The convenience it brings for the operators makes them less exhausted and more productive. 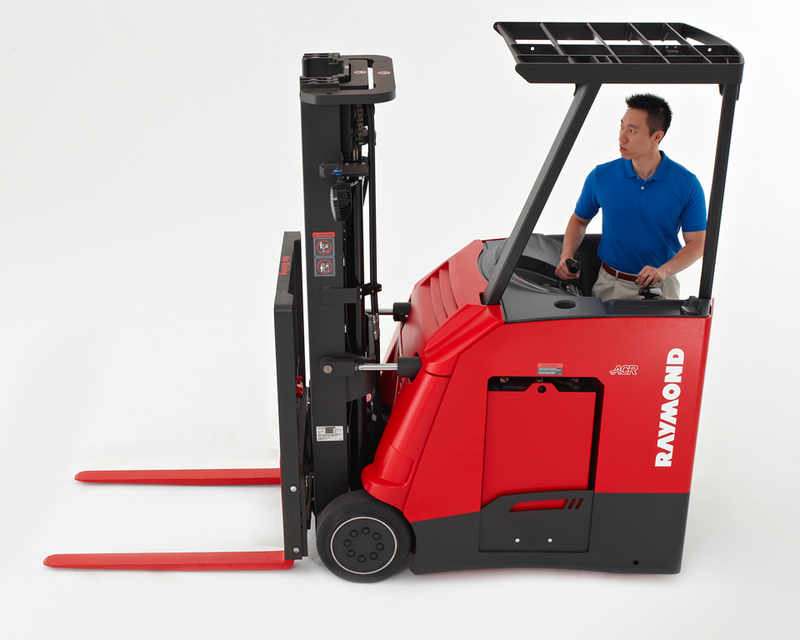 Sit down forklifts have a wide turning radius making them more perform much better in tight spaces. It is more versatile and precise during operation at docks and warehouses. Working in standing position makes the operators more attentive and watchful according to report. Stand up forklift is perfect choice in warehouses with close quarters, this kind of forklift is smaller in size that makes them more mobile during operation in tight aisle. This forklift gives the forklift operator better view and visibility making them aware of the surroundings to prevent accidents. Many injuries related to operation of stand up forklifts have been reported. This is due to the nearness or proximity of the operator to peripheral parts of the machine and tight environment where this forklift is being operated in. Always maintain good habit of getting trained prior to driving a certain type of truck. This will ensure operator knowledge and competency. Always maintain good attitude when operating the forklift, never horseplay, portray rude attitudes, and play a joke driving the truck.